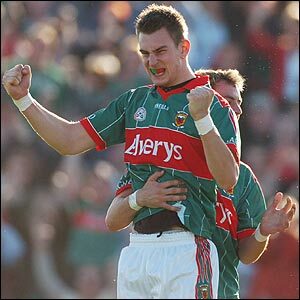 Mayo God Help us if the players come from the West of the county! Only Burrishoole qualified for the last 8 in the SFC! I know there are a few Knockmore people on these boards. I hear that Damien Munnelly is playing savage stuff this year. Do ye think that he will be in JOM's plans for next year? Go seasfaidh mé thíos i lár Chondae Mhaigh Eo. He seems to be scoring well indeed, always thought Munnelly needed to bulk up more a lot more to be able from Senior Inter-County, has he done that? We didn't have much power and even less of a base against derry. I am finally seeing the light, we simply do not have either the players or the heart to win sam inside the next 5 years.A dose of the present lads will leave and the replacements most likely are unable to fill their boots.David Brady?Ciaran Mac?Nallen?Heaney? Please name a replacement for any of the above in their prime.And the loss of Hanley to the b**tard game of afl is bigger blow than we know just yet. Also reliably informed the great blond is not returning after his 10 minutes against derry when it was all over and i hardly blame him.D brady and oneill will hardly come back, they know by now its a dead horse they are flogging and 96 was the one that got away for brady and nallen who will hardly want more suffering. JOM had better have something special planned for next year because getting hammered by derry will not be forgotten anytime soon and regardless of what players are on the field he will bear the brunt for collapsing as much as the kudos for winning. Power base of Mayo Club Football is surely Greater Castlebar now. Time to take a more chill-pill approach to life. Greater Castlebar my hole. Ballintubber and Tuar Mhic Eadaigh are not Suburbs of any town. End the land grab now!!! !